Teaching children how to navigate the complex social universe, this everyday strategy guide helps them to develop healthy social skills. 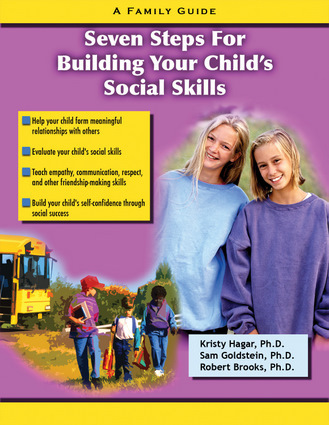 Informed by current research on character development, this handbook helps parents, educators, and health-care workers understand which critical social skills determine future success and how to incorporate the teaching of those skills into everyday life. Practical advice emphasizes building children's resilience and the management of social conflicts while teaching them how to make and keep friends and appreciate their own strengths and the strengths of others. A troubleshooting section addresses common problems and how to solve them, and two addenda focus on specific socialization issues faced by educators and health-care workers. Kristy Hagar, PhD, is a pediatric neuropsychologist at Children's Medical Center of Dallas and an assistant professor of psychiatry at the University of Texas Southwestern Medical Center in Dallas. She lives in Dallas, Texas. Sam Goldstein, PhD, is a coauthor of Angry Children, Worried Parents. He is a member of the faculty at the University of Utah and works as a clinical neuropsychologist at the Neurology, Learning and Behavior Center in Salt Lake City, Utah. He lives in Salt Lake City, Utah. Robert Brooks, PhD, is a coauthor of Angry Children, Worried Parents. He is on the faculty of Harvard Medical School and has a part-time medical practice. He lives in Needham, Massachusetts. They are the coauthors of Seven Steps to Help Your Child Worry Less.